Was this a bottle stopper? Can you tell what this was? I found it on Whidbey Island in Washington State. I'm hoping it's a perfume bottle stopper and not a boring old spark plug or something! "RESL"? on a glass bottle? What are these Milk Glass Beach Finds? Is this Sea Glass Bottle worth anything? 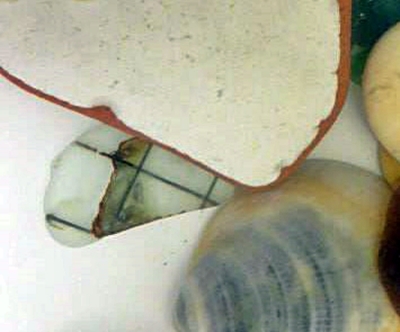 Real or Fake Sea Glass Marbles? Comments for Was this a bottle stopper? Today at the Jersey Shore, I found ALL frosted Lavender bottle stopper. A little under than 2" long! Just the same picture as above. You have found a GREAT piece & it is a glass perfume bottle stopper! If it is grey,you've really got a find! 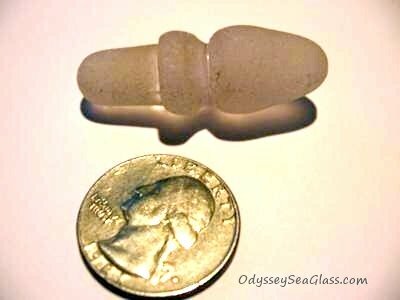 Grey seaglass is VERY RARE. Good for you! sure looks like a perfume bottle stopper - what a great find! That is so cool,i think it is a bottle stopper, but what a find!!!!!!! !